Last night I attended the Great Easter Vigil at St Anastasia on the island in St Augustine. It was the tenth anniversary of my joining the worldwide Catholic Communion. That night ten years ago in Tonga was the culmination of a journey I’d been on for years, but for family reasons, had never quite completed. But that year my daughter became engaged to a faithful Catholic man. The idea of joining the Catholic Church wasn’t new to her either as she’d been enrolled in CCD classes during her growing up years. So, now, with her wedding approaching, she was preparing to be received into the Catholic Church at the Easter Vigil. I was in the Peace Corps and stationed half a world away, but the closeness my daughter and I had always shared seemed to reach out and tell me it was my time, too. I went to see the bishop of Tonga for guidance and was set on a course of retreats with the sisters at the convent on my remote little island. Thus it was that thousands of miles apart, my daughter and I stood before our respective congregations on that most solemn and joyous of Christian festivals and confessed our faith anew. As I sat in the pew last night, waiting for the lights to dim and the vigil to begin, I remembered back to Holy Week in Tonga, to the rituals that are so much the same for Catholics everywhere, and yet can be so different in each culture. Not just in language, but in observance and passion. This year our new pope celebrated Maundy Thursday by washing the feet of young prisoners in Rome. He broke tradition by including women as well. Ten years ago in Tonga, the priest at my church washed the feet of young people preparing for confirmation. Often in our churches here in the states, it is people chosen from the congregation. On Good Friday my second year back at home in the United States, I experienced the Way of the Cross at the cathedral in St Augustine, Florida. The cross bearer, two boys with candles and the priest rushed from station to station rattling off the prayers so rapidly that I found it impossible to follow and had no time for reflection. Just a few years before I’d dressed in the traditional Tongan black and followed a young man carrying an enormous and very heavy cross through the steamy streets of Neiafu on my tiny South Pacific island stopping to pray at length fourteen times. Each time it was harder for the young man to pick up his burden and move on. Near the end, he was hoisted up and his arms lashed to the arms of the cross. He pressed his heels in hard against a one-inch block beneath his feet for support. As the prayers dragged on and the silences stretched out, the young man’s muscles began to quiver with the effort and sweat poured down his face. He wore a crown of thorns and it had pricked his skin adding his own blood to the sweat. It gave me, for the first time, a viscerally intense picture of the physical torment Christ endured during those three hours he was nailed to a cross to die for me and for many to wash away our sins. Two similar rituals, yet very different in impact. Another vivid memory I have of my Holy Week in Tonga was the all night vigil. 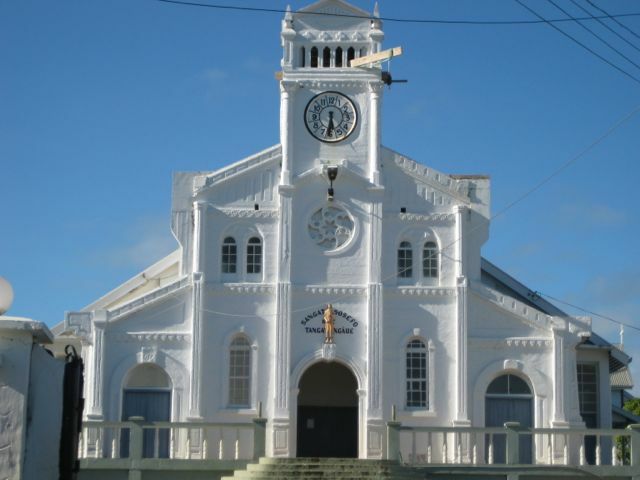 Each village was assigned an hour to keep watch at the cathedral in Neiafu. Our village had two to three o’clock in the wee hours of the night. I slept for a couple hours before rising to join my neighbors. We rode to town in the back of a pick up truck, then, in our traditional Tongan garb, filed into the cathedral to the small chapel set up for this night. It was decorated as only Tongans can decorate, with silver streamers and impossibly brilliant imitation flowers. Gaudy by my standards, but beautiful by theirs. We began with prayer, but then moved to singing. One thing the Tongans do supremely well is singing a cappella. They have beautiful voices and they pour their hearts and souls into it. We knelt on the hard stone floor, singing and praying in the still, semi-dark cathedral until we were relieved by the next village on the schedule. The ladies returned to the pickup truck while the men gathered in a cluster on the cathedral steps to talk. I remember laying with the other women on mats lining the bed of the truck, cocooned in the tropical night air, in the stillness of that hour, listening to the soft murmur of the men’s voices and staring at the vast array of stars overhead. I was filled with such peace and it was a moment that will stay with me for the rest of my life. Then came the Easter Vigil. I’d spoken with my daughter earlier by phone. I knew that in a few hours, she would be standing at the front of her church in New York, just as I was now standing at the front of the Cathedral on a tiny island in the South Pacific. Having grown up and been confirmed in the Episcopal church, we weren’t being confirmed, but rather reaffirming our creed and being received into the Catholic Communion. We had studied and explored the nuances of our new allegiance. We had made a good confession and been cleansed. We were eager and ready to confess our faith and be marked with oil. When I left Tonga the following year in the middle of lent, I journeyed home through New Zealand where I worshipped at the Catholic Cathedral in Christchurch on the South Island. I found another Catholic church in Sydney Australia the following Sunday. The accents were different, but the words familiar. Palm Sunday found me in Thailand where I understood not a single word of the prayers or sermon, but it was the mass and I knew the English prayers in my head. It began with a procession in the quiet streets of a neighborhood of homes and embassies in Bangkok. We carried palms and sang hosannas as we went. Later, inside the church, when we joined hands to say the Lord’s Prayer, I felt I was a tiny link in an endless chain that circled the globe. It felt good. Easter I celebrated in Vietnam, in an English speaking church a local man had directed me to in Hanoi. The voices were lighter and more lyrical than those in Tonga, but the music was just as heavenly. I realized I was now at home wherever I went anywhere in the world. As I repeated the prayers then and still, I know I share those moments with brothers and sisters in Christ who believe and worship just as I do in every part of this place we call Earth.